The award winning centre is an essential resource for the classroom and comes with many unique features and accessories all designed to help teachers. Includes an enhanced magnetic dry erase surface, adjustable book/pen ledge, 4 storage tubs and a foot activated brake mechanism. 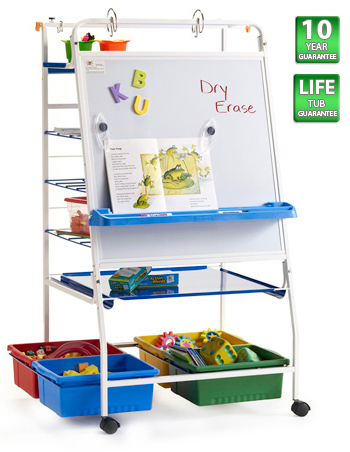 This double sided unit comes equipped with two magnetic dry erase whiteboards, one with spaced blue lines to aid children when writing, roll-up felt display with corner ties and two handy storage tubs.  Frame: 650 x 720 x 1240mm.  Whiteboards: 850 x 590mm. 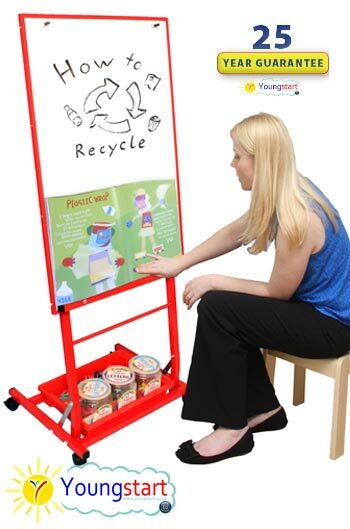  A colour trimmed mobile paint easel unit ideal for providing a creative, storage space for young children. 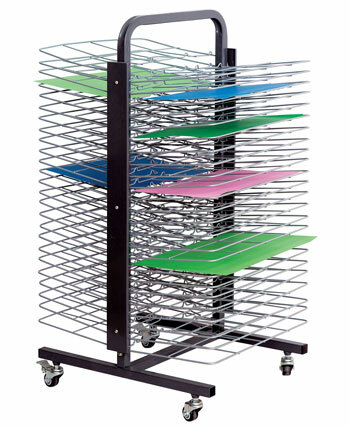  Features 2 storage trays suitable for keeping art equipment safe and tidy.  A brand new design of storage and display, the Denby range is specifically tailored for the early years environment. 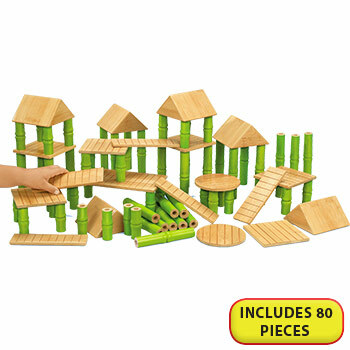  Can be optionally manufactured from Maple MFC, Beech MFC or Oak MFC (melamine faced chipboard). 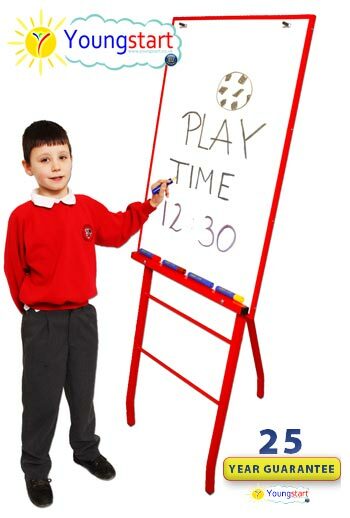  Can also be supplied with an attached whiteboard on the reverse of the easel unit.  Features curved edges for extra safety.  Features lockable castors for easy mobility.  Available in 4 colour themes: blue, green, yellow or red.  Available in three heights.  Please allow 2-4 weeks for delivery. The Standard Reading and Writing Centre with enhanced magnetic dry erase surface and 10 year frame warranty is designed to assist teachers when instructing students front of class. The centre comes with an assortment of extra features including a height adjustable book/pen ledge, assorted hooks designed for hanging pocket and flip charts plus an additional removable dry erase board. Centre has a sturdy castors and foot activated brake mechanism for complete mobility. An ultimate classroom resource with large magnetic dry erase surface, 4 storage tubs with easy slide out access and assorted hooks for accommodating pocket and flip charts. The internal shelving provides double the storage capacity of a similar A frame centre, whilst using the same amount of floor space. A unique compact resource with a lightweight fold down design. 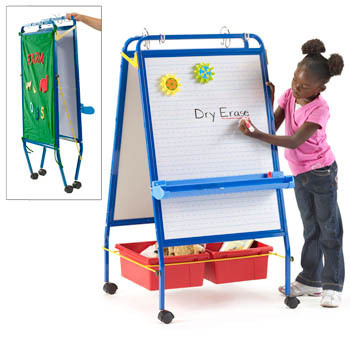 Double sided, the easel has two magnetic dry erase boards, one with spaced lines and each with its own book/pen ledge. 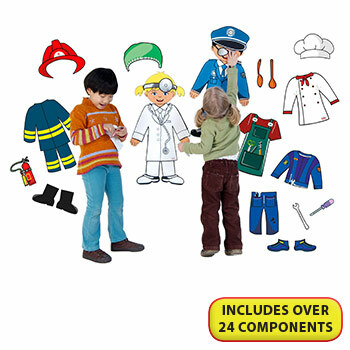 Comes with a detachable pocket chart and 3 removable tiny tubs. A unique compact resource with a lightweight fold down design. 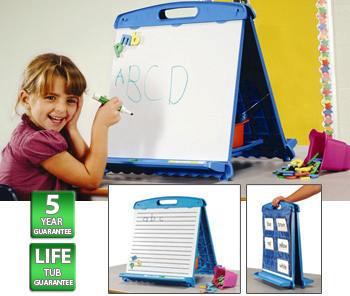 Double sided, the easel has two magnetic dry erase boards, one with spaced lines and each with its own book/pen ledge. 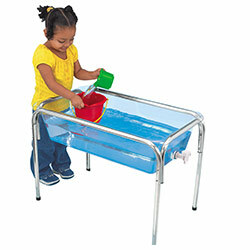 Comes with a detachable pocket chart and 3 removable tiny tubs. 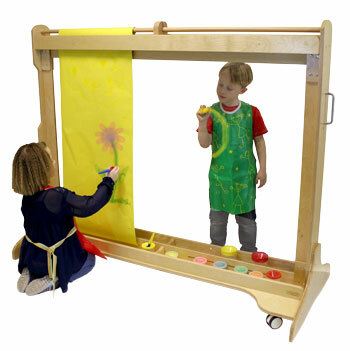 This Desktop Painting Window is an excellent addition for outdoor and indoor art classes, with its clear transparent window children are encouraged to paint and observe their surroundings through the window and will allow children to discover reflections, paint landscapes, wildlife and even portraits by having one child stand on the otherside of the window whilst one child paints the portrait. Lots of fun !  Supplied with wooden mounted tray for storing paints and brushes.  Even though this unit can be used both indoor or outdoor, we recommend bringing back indoor after use and not left outside over night, this will help to keep the unit in the best condition possible for longer. Manufactured from a combination of Russian birch plywood and European beech wood. 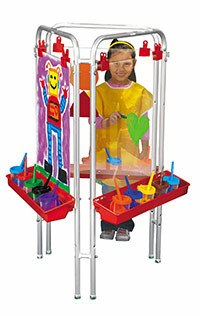 This Free Standing Painting Window is an excellent addition for outdoor and indoor art classes, with its clear transparent window children are encouraged to paint and observe the outdoors and surroundings through the window and will allow children to discover reflections, paint landscapes, wildlife and even portraits by having one child stand on the otherside of the window whilst one child paints the portrait. Lots of fun ! This Giant Painting Window is an excellent addition for outdoor and indoor art classes, with its large clear transparent window children are encouraged to paint and observe the outdoors through the window and will allow children to discover reflections, paint landscapes, wildlife and even portraits by having one child stand on the otherside of the window whilst one child paints the portrait. Lots of fun ! Easy to wipe down and clean after use. Paint pots can be placed in the designated channel at the base of the unit, easy accessible for the children to reach whilst in use.  Featuring castors for complete mobility.  Paper shown within images, is not included.  Manufactured from a combination of Russian birch plywood and European beech wood. 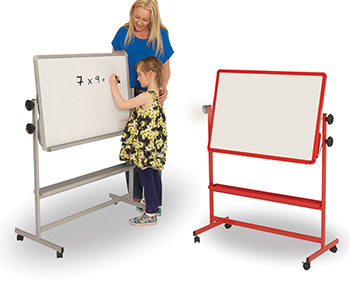 This stylish and lightweight mobile whiteboard easel has been specifically designed for classrooms where space is at a premium. 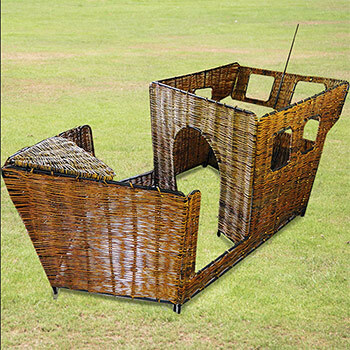 It can be quickly and safely folded flat, thus requiring the minimum amount of storage space. With four different heights to choose from the uniquely designed magnetic and dry wipe whiteboard simply clicks on and off at the height required. Nothing could be easier. A must have product for the modern classroom. 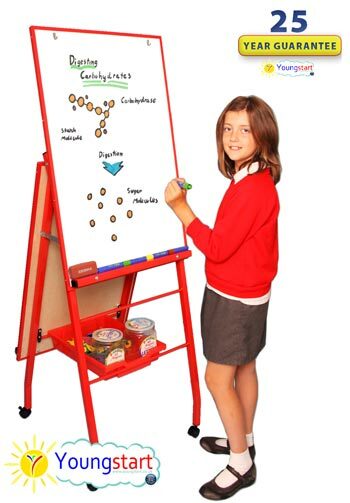 The 900mm x 600mm white board is magnetic and dry wipe "all on one surface". The easel also incorporates flip chart pegs, a full length pen ledge and one removable 427mm x 312mm x 75mm Gratnell storage tray. 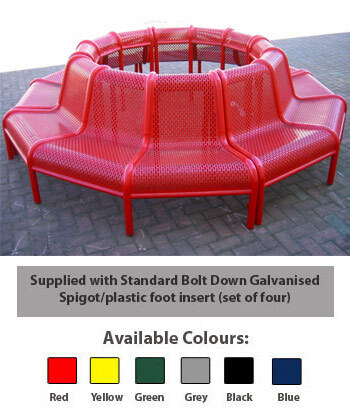 Available in Red or Blue extremely durable high gloss powder coat finish. 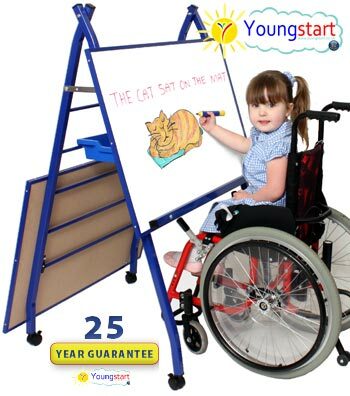 To complete this superb "wheelchair friendly" design the easel is fitted with 4 locking castors allowing safe and easy movement from classroom to classroom. This product carries a 25 year manufacturer's warranty as standard making it a superb long term investment. 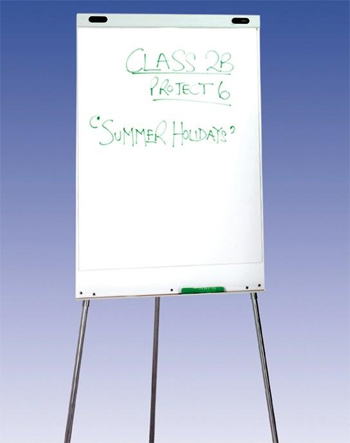  Large white board of 900mm x 600mm. 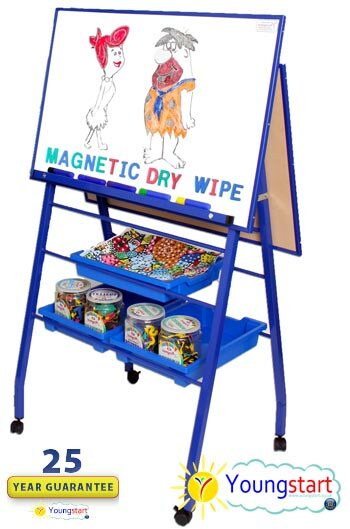  Magnetic and dry wipe "all on one surface"
 Full length pen ledge and flip chart fittings.  One 427mm x 312mm x 75mm removable Gratnell storage tray. In the colour choice of frame. Red or Blue. 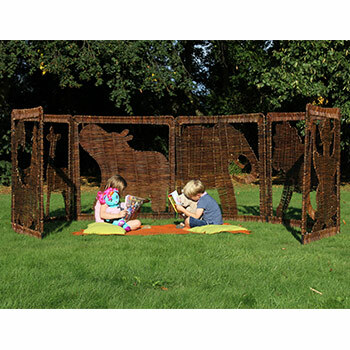  Extremely durable, stable and safe. This is a stock item. Please allow up to 3 to 5 days for delivery. 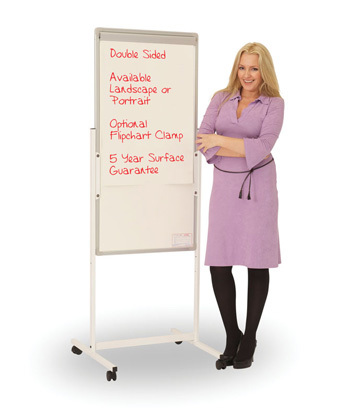 With two back to back landscape style whiteboards this mobile A-frame easel is extremely versatile. Five quick and easy height adjustments allow the boards to be perfectly positioned for children of all age groups to work on, whether sitting or standing. The uniquely designed whiteboards simply click on and off at the heights required. Nothing could be easier. "measured from the floor to top of white board"
Available in Red or Blue high gloss extremely durable powder coat finish.  2 x large white boards 900mm x 600mm.  Full length pen ledges and flip chart fittings.  Three 427mm x 312mm x 75mm removable Gratnell storage trays. In the colour choice of frame. Red or Blue. Full range of spares available from our manufacturer. A great investment with a full 25 year manufacturer's warranty. Made to order. Please allow 3-5 days for delivery. 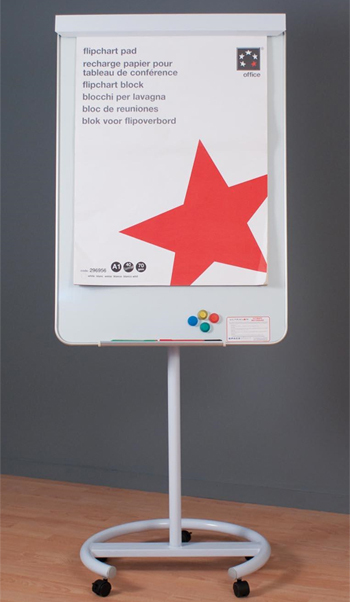 With the advantage of two whiteboards this portrait style mobile easel ensures extra versatility within the teaching environment. 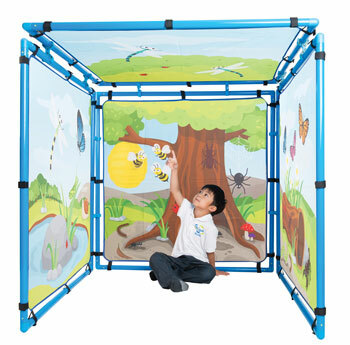 The sturdy A-frame construction guarantees total stability and complete safety within the classroom setting. The two uniquely designed magnetic and dry wipe whiteboards simply click on and off at the heights required. Nothing could be easier. This traditional tripod style easel is extremely lightweight and portable. A perfect product for front of class presentations especially when using a flipchart. 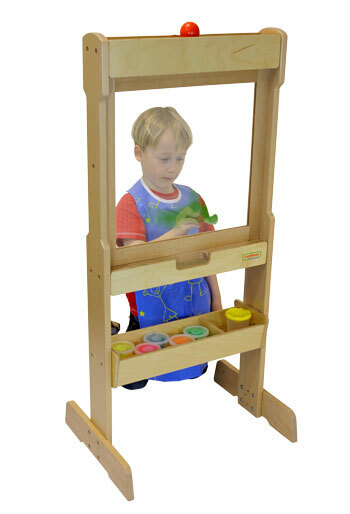 This easel can be quickly and easily folded flat thus requiring a minimum amount of storage space. With four different height adjustments to choose from the whiteboard simply clicks on and off at the height required. Nothing could be easier. The large 900mm x 600mm white board is both magnetic and dry wipe "all on one surface" and incorporates flip chart pegs and a full length pen ledge. 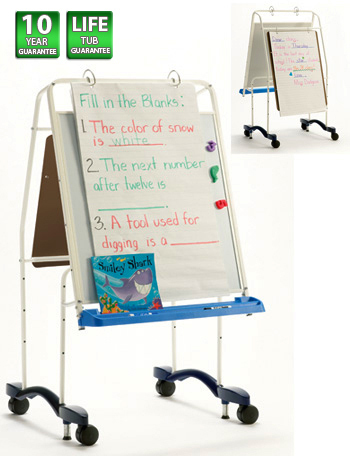 This light and versatile tripod easel can be used any where in the classroom environment, especially in tight corners where space is at a premium.  1 x large white board 900mm x 600mm. 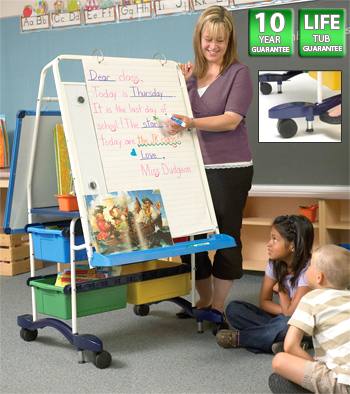 This thoughtfully designed mobile easel guarantees safe and comfortable access for all wheelchair users from very small children right through to adults. Both boards can be used simultaneously ensuring group participation regardless of age or ability. Each individual whiteboard simply clicks on and off at the height required. Nothing could be easier. Comes complete with a fully comprehensive 25 year manufacturer's warranty.  One Gratnells plastic storage tray. In the colour choice of frame. Red or Blue. A very special design with a multiplicity of uses. 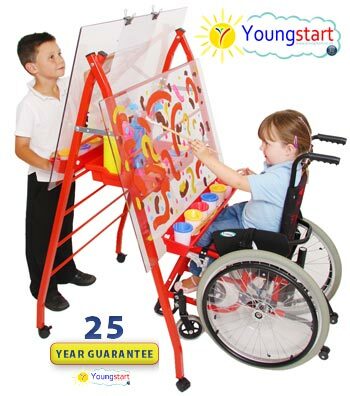 This wonderful mobile easel guarantees safe and comfortable access for all wheelchair users from very small children right through to adults. Both boards can be used simultaneously ensuring group participation regardless of age and ability. This specially adapted "double sided" model has been specifically designed to be compatible with all styles and sizes of wheelchairs. 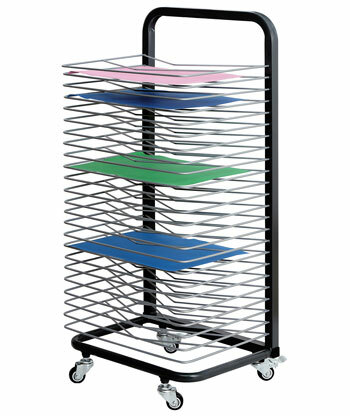  Includes one shallow Gratnell storage tray in the colour of your frame choice. Red or Blue. 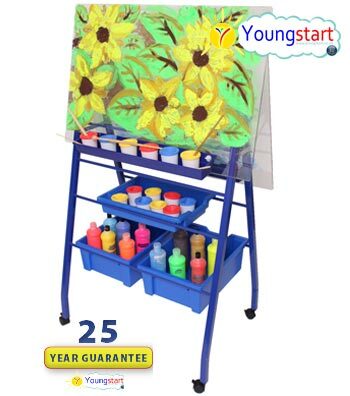 This superb "double sided" mobile art easel ticks all the boxes with multiple height adjustments to suit all age groups. 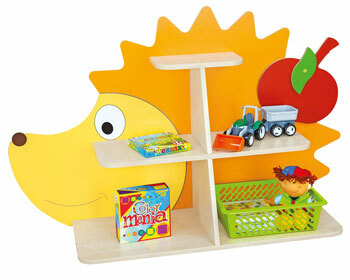 Extensive storage space and a plethora of other features put it top of any teacher's wish list. The two 900mm x 600mm premium quality polycarbonate sheets are virtually unbreakable and can be used to hold paintings and drawings etc. Alternatively the budding artist can paint or use dry wipe markers directly onto the clear "see through" work surface. It can then just be wiped clean ready for the next masterpiece.  Both polycarbonate work surfaces come complete with removable and replaceable plastic trays which are used to hold paint pots, brushes, dry wipe markers, crayons etc.  The easel frame has four locking castors and comes complete with three Gratnells storage trays. In the colour choice of frame. Red or Blue. 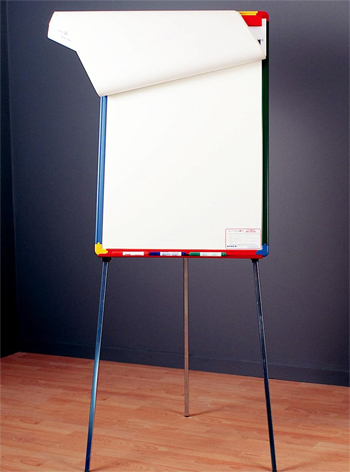 Freestanding double-sided magnetic vitreous enamel steel whiteboard on steel stand with locking castors. The board can be fixed in either a landscape or portrait position. 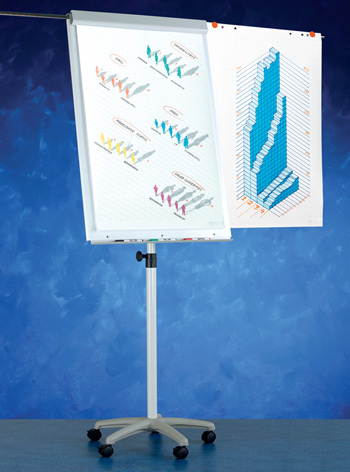 There is an optional universal flipchart clamp which can hold any A1 pad. The board is a plain high-gloss drywipe magnetic board with a discrete 25mm grid on one side to assist with alignment of writing or drawing, the grid is indistinguishable from a distance. Board surface is guaranteed for 25 years on both sides. For boards where the max dimension is 1200mm the max overall height is 1790mm. For boards where the max dimension is 1800mm the max overall height is 2390mm. Please allow approx. 2-3 weeks for delivery. Boards rotate vertically through 360° and lock at any angle. The robust stand is made from a solid steel with an integral pen or chalk ledge. The board frame is an anodised aluminium with rounded corners. Also available is an optional flipchart clamp which accepts any A1 flipchart pad. Overall height of unit 1830mm. Square or line markings can be applied at extra cost (call 01257 426351 for details). One side features a feint gridguide to help alignment of writing or drawing, this is indistinguishable from a distance. Boards are guaranteed for 5 years on both sides. Boards rotate vertically through 360° and can be locked at any angle. The robust stand is made from a solid steel with an integral chalk ledge. The board is made from an anodised aluminium with rounded corners. Also available is an optional flipchart clamp which accepts any A1 flipchart pad. Overall height of the unit is 1830mm. Both sides are guaranteed for 5 years. 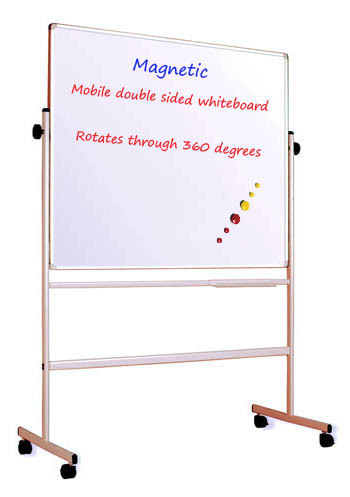 Double sided magnetic mobile revolving whiteboard which rotates through 360 degrees. The lightweight yet robust steel frame has 4 castors. 2 of which are lockable. Central fixing hand wheels securely hold the whiteboard in position. Boards may rotate vertically through 360° and can be locked at any angle. The robust stand is made from a solid steel with an integral pen ledge. The board is made from an coated steel with rounded corners. High gloss drywipe board mounted on a solid steel stand with lockable castors. The board can be fixed so as to pivot horizontally or vertically depending on your preference. The overall height of the frame is 1770mm. The board pivots through a full 360° and can be locked in place for stability when in use. A choice of boards is available, either double sided Non-Magnetic whiteboard with a feint 25mm grid guide and plain reverse or a plain double sided Magnetic board. Magnetic drywipe surface with flipchart clamp. Freestanding, double-sided board on coated steel stand with braking castors and stability bar. Magnetic and non-magnetic surface available. Harlequin colour-mixed frame with contrasting coloured rounded safety corners. Board can be height adjustable by 210mm. Overall stand foot depth 540mm. This product has a 5 year surface guarantee. 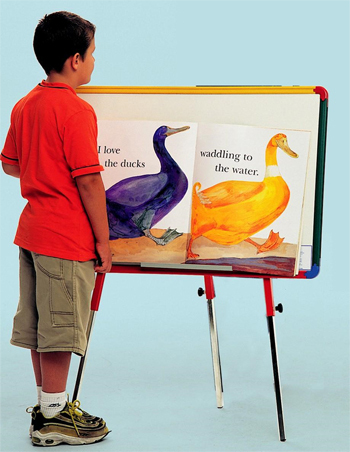 2-sided writing easel with your choice of board surfaces. 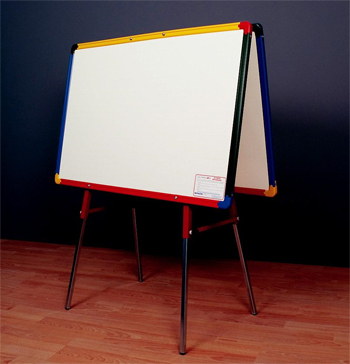 Choose from twin whiteboards, twin chalkboards, twin whiteboard/chalkboards or twin magnetic whiteboards. Also available is a convenient carrying bag for easy transportation and a flipchart clamp. 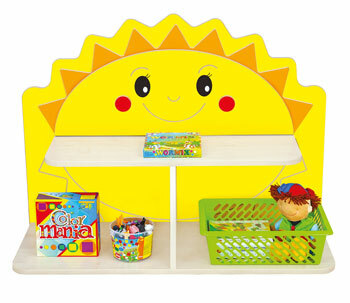 Twin desktop easel with your choice of board surfaces. 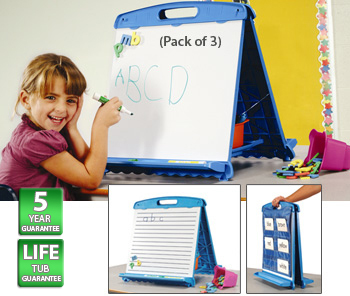 Choose from twin whiteboards, twin chalkboards, twin whiteboard/chalkboards or twin magnetic whiteboards. 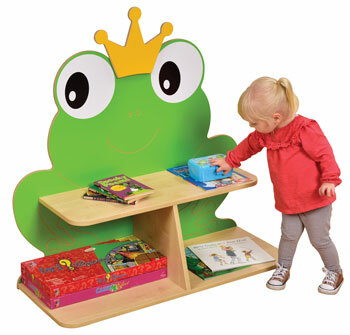 Freestanding writing easel with your choice of board surface. 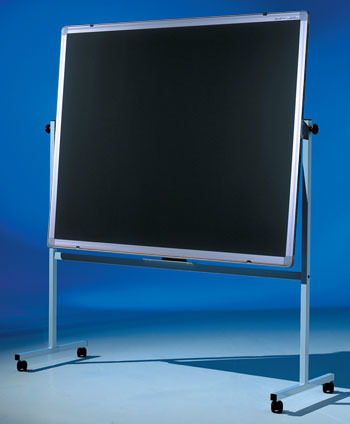 Choose from non-magnetic whiteboard, magnetic vitreous enamel whiteboard or black chalkboard. Also available is a convenient carrying bag for easy transportation. 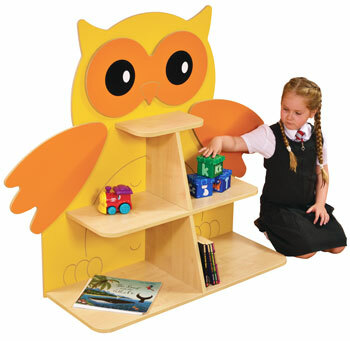 Freestanding writing easel with your choice of board surface. Choose from a whiteboard, chalkboard or magnetic whiteboard. Also available is a convenient carrying bag for easy transportation and a paper clamp. 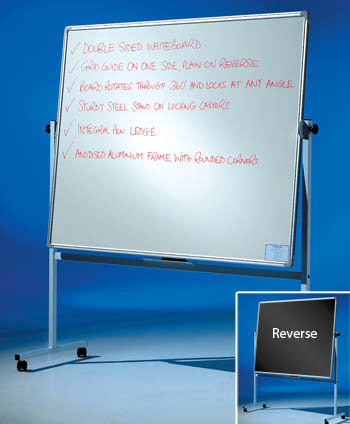 Rotating double-sided whiteboard, lockable in any position, with non-magnetic drywipe surface. 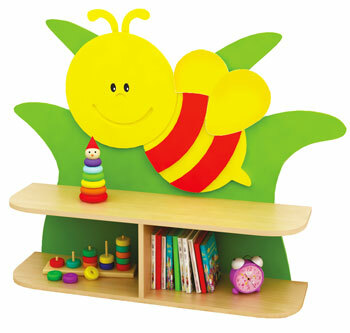 Full length ledge for displaying big books. Frame is powder-coated steel in Grey or Red with 4 lockable castors. Board can be ruled with lines. 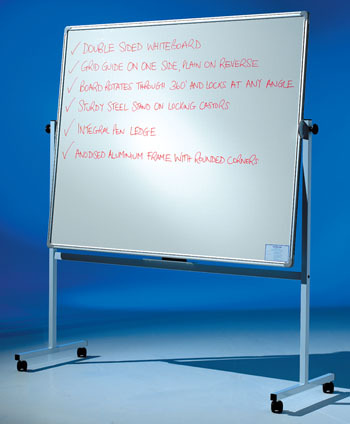 Rotating double-sided whiteboard, lockable in any position, with vitreous enamel steel (V.E.S) magnetic drywipe surface. 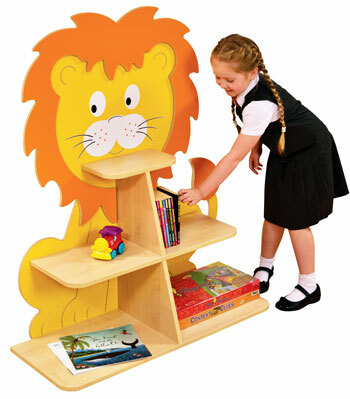 Full length ledge for displaying big books. Frame is powder-coated steel in Grey or Red with 4 lockable castors. Board can be ruled with lines or squares. 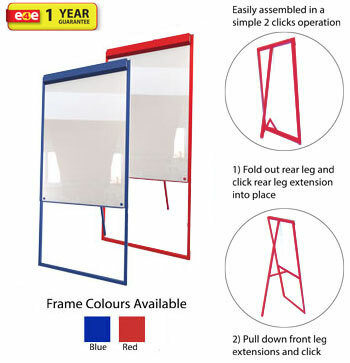  The easiest easel on the market to set up and use.  Simple 2 step operation ready to use in literally 2 clicks.  Metal frame and high quality, non magnetic drywipe surface.  This product has a 1 year surface guarantee.  Comes with Universal flipchart clamp.  Available in three colours to choose from: red, blue and cerise.  Dimensions: (HxWxD) 1550 x 635 x 675mm.